42 STAR FLAG 30”X 39”. CIVIL WAR OFFICERS CANTEEN WITH UTILIYY. RARE CIVIL WAR CANNON PULLING SADDLE. CIVIL WAR BRASS GANG MOLD 36 CALIBER. G.A.R. 26TH. GRAND ENCAMPMENT WASHINGTON D.C. 1892 CANTEEN. AB. LINCOLN HAND WRITTEN LETTER. CO. F. 12 NEW JERSEY VOL. INF. LATTER BADGE. ANTIQUE AB. LINCOLN OIL PAINTING SIGNED. US TERRITORY. IMPERIAL PROVIDENCE RHODE ISLAND FORK KNIFE. DANCE & PARK COLUMBIA TEXAS STENCIL TIN. CONFEDERATE BATON ROUGH ARSENAL SWORD. CIVIL WAR 5TH CAV SLOUCH HAT. MISSOURI CONFEDERATE GUERRILLA JAMES NEWTON VAUGHN. CDV PHOTO. CIVIL WAR BELT & BUCKLE. 1860 COLT ARMY CIVIL WAR HOLSTER. CIVIL WAR BLOOD LETTING KNIFE. 1800’S MILITARY FIELD BOX & PLATE. WILLIAM J. PATTERSON 51ST BOSTON MASS GAR MEDAL. CSA CIVIL WAR REBEL FLAG. Civil war CSA Rebel flag in frame. Measures 17 1/4” x 11 1/2”. 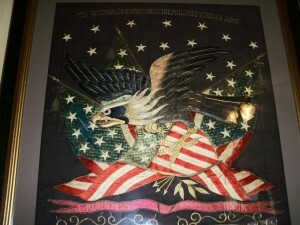 A rare flag for any civil war collection. CIVIL WAR CONFEDERATE BULLS EYE CANTEEN. CIVIL WAR POWDER KEGS AMERICAN POWDER. SENT TO MEMPHIS TENN.
CANNON BAR SHOT CIVIL WAR. 1853 US BATTY POWDER FLASK. CIVIL WAR HORSESHOE INSIDE TREE. 1800’S SCRIMSHAW POWDER HORN SHIPS. 1839 LIVES OF THE PRESIDENTS BOOK. 1830’s TEXAS CLIP POINT BOWIE KNIFE BRASS SPINE. SOUTH CAROLINA MARKED CIVIL WAR SPURS. CIVIL WAR SLAVE BALL & CHAIN. MAHER & GROSH TOLEDO OHIO CIVIL WAR NAVAL KNIFE. 12 POUND REV. WAR BRASS CANNON BALL. CIVIL WAR NAVAL CARVED WOOD BALL & CHAIN. OLD LINCOLN PRINT IN OLD FRAME. CIVIL WAR FLEM BLOOD LETTING KNIFE. CIVIL WAR SOLIDER CARVED ONE PIECE WOOD. CIVIL WAR ARTILLERY BIT MAKER MARKED. CIVIL WAR SHORT SWORD MAKER MARKED. 1862 MISSOURI $20 DOLLAR BILL. RARE CIVIL WAR SLAVE COLLAR & CUFFS.